Panorama is a multimedia browser for electronic magazines. You typically create an issue of your magazine and you distribute it along with the Panorama executable. Your readers download the issue and read it offline using the Panorama browser. Although you can easily convert all text and images of an issue to HTML, Panorama ensures that the text is always displayed correctly in the same manner. Additionally Panorama can display animations and play sounds and music. 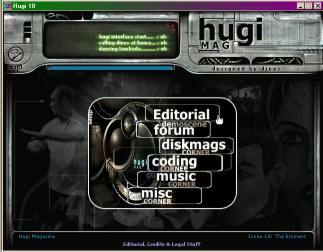 Finally, every issue of your electronic magazine can look different and have a different user interface, like the underlying software was changing. Panorama is fully configurable providing you with all options a magazine editor would need. Articles in your electronic magazine are arranged hierarchically. They are formatted with a HTML-like language, that offers several fancy formatting options. The final look of the magazine is up to you. Panorama is fully configurable and skinnable, enabling you to design your own user interface, with images, buttons, mouse cursors and more. Every article can be displayed using many different skins, and every article can have its own, specific skins. Panorama can play sounds when the reader performs certain actions or it can play music while the reader digests your magazine. The Windows version of Panorama uses DirectX, and it can be run either in a window or in fullscreen mode of your choice. 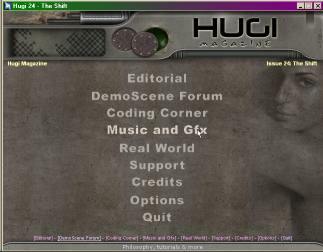 Panorama was primarily made for Hugi, but now any magazine can use it. For non-profit purposes Panorama is totally free. The only requirement is notifying me where I can get your mag from. The use of Panorama for non-free purposes (CD mags or whatever) is negotiable (not necessarily free). The package contains Panorama executable and all documentation. Panorama icon has been created by TAD/Hugi. The SDL (Linux) port of Panorama has been done by Michael Barkholt. Panorama DTP utility has been made by Drew Green. Word2Panorama converter has been created by Anatoliy Samara. Portions of the program include Independent JPEG Group’s free sources. Portions of the program include Eugene Roshal’s free sources. The Windows version supports BASS sound system by Ian Luck. Partial FMOD sound system (by Brett Paterson) support in the Windows version can be enhanced on request. The Linux versions include FreeType free sources. The SDL version uses SDL.